McGaugh-Gerard Lecture aims to encourage public education, scientific discourse and exposure to world-class science. 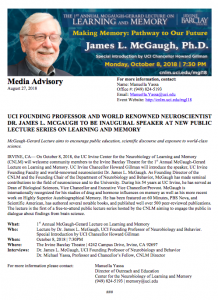 IRVINE, CA— On October 8, 2018, the UC Irvine Center for the Neurobiology of Learning and Memory (CNLM) will welcome community members to the Irvine Barclay Theatre for the 1stAnnual McGaugh-Gerard Lecture on Learning and Memory. UC Irvine Chancellor Howard Gillman will introduce the speaker, UC Irvine Founding Faculty and world-renowned neuroscientist Dr. James L. McGaugh. As Founding Director of the CNLM and the Founding Chair of the Department of Neurobiology and Behavior, McGaugh has made seminal contributions to the field of neuroscience and to the University. During his 54 years at UC Irvine, he has served as Dean of Biological Sciences, Vice Chancellor and Executive Vice Chancellor/Provost. McGaugh is internationally recognized for his studies of drug and hormone influences on memory as well as his more recent work on Highly Superior Autobiographical Memory. He has been featured on 60 Minutes, PBS Nova, and Scientific American, has authored several notable books, and published well over 500 peer-reviewed publications. The lecture is the first of a free-to-attend public lecture series hosted by the CNLM aiming to engage the public in dialogue about findings from brain science. The McGaugh-Gerard lectures are made possible by the McGaugh-Gerard Endowment that was established by Dr. James L. McGaugh and the family trust of the late Dr. Ralph W. Gerard. Click here for media advisory.